1850: In a covered wagon from Independence/Missouri to California along the Oregon and California Trail (approx. 2,000 miles) – 6 months. Timed right, one left in Spring and arrived in October. That was under good conditions – if they were unfavorable, one might not arrive at all. 1858: First non-stop stage coach from St. Louis to Los Angeles (2,000 miles) – 20 days. Hard on the derrière for passengers. 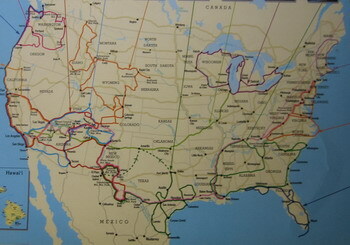 1860: Pony-Express from St. Louis to Sacramento (1,996 miles) – 11 days. They took mail only, no passengers. Tough luck. 1876: First trip of the Transcontinental Express train from New York City to San Francisco – 83 hours and a bit. Now passengers can speed from coast to coast. 1923: First non-stop flight Long Island to San Diego (2.470 miles) – 25 hours 50 minutes. The plane had to be adjusted to carry the massive amounts of fuel needed. No passengers, sorry. 1929: First combined rail and air passenger service from coast to coast – 48 hours. No non-stop service, though. 2006: Traveling by car from New York City to Los Angeles – 31 hours 4 minutes. Some speed limits were broken while setting the new record. Every time I visit west Texas, I think of the people who settled out there and how lonely it must have been for those early settlers. The wagon ride must have been horrid, too, particularly in the hotter weather. Oh yes, riding in a covered wagon to the West can not have been something for the faint of heart. These early settlers have my full admiration – especially the women.